I went into labour on Saturday 15 August, about an hour after I got back from Old Bond Street, where I bought a bracelet in Tiffany’s. This will always be the weirdest part of her birth story I think – I’d just completed on the sale of my business to my business partner, and wanted to buy myself something to mark/remember the success of the business, and decided that what I really wanted was a bracelet from Tiffany’s. 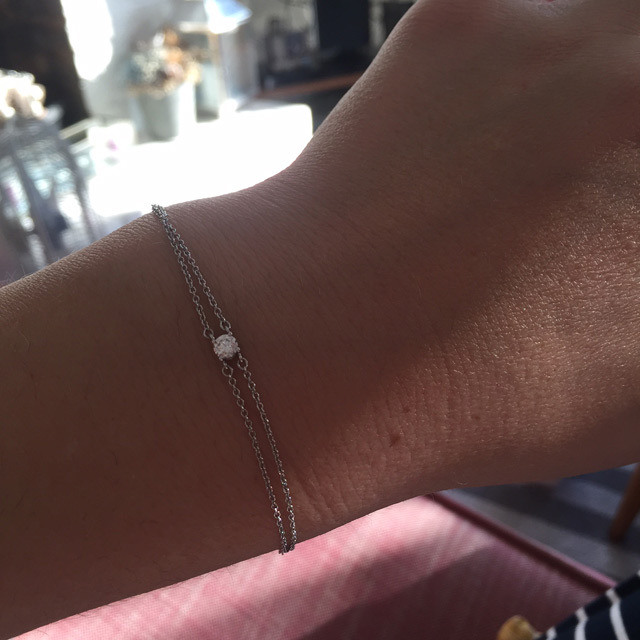 I woke up that morning with a really clear idea in my head that I had to get the bracelet that day – Oli thought I was completely barmy, as I was seriously pregnant and uncomfortable and hadn't been up for going into central London for ages, and especially not on a Saturday. But I insisted and he eventually agreed to come with me (there was a lot of eye-rolling though). So off we set to Green Park, and within about half an hour I was in and out of Tiffany’s and carrying my bracelet home. One of my speediest purchases ever. I am sure that my feeling of having to get the damn bracelet that day was my ‘nesting’ instinct kicking in – many women say they feel desperate to clean their houses or finish off last-minute jobs the day before they go into labour, as though they are trying to get everything ready, knowing that after the baby is born life will never be the same again. My version of this just happened to be spending stupid money on jewellery, but there you go. What can I say? I am a terrible person. However, in my defence, I definitely don’t think I’ll be paying another visit to Tiffany’s any time soon in the next few years. And I quite like the surrealness of the situation; me sitting in Tiffany’s like a beached whale, all sweaty and swollen, trying on bracelets that would barely do up around my puffed up wrists, in front of a very bemused sales assistant. The night before, we’d had a curry, and I’d woken up with a bit of an upset tummy. Which was unusual, as I’d been so constipated for weeks before. 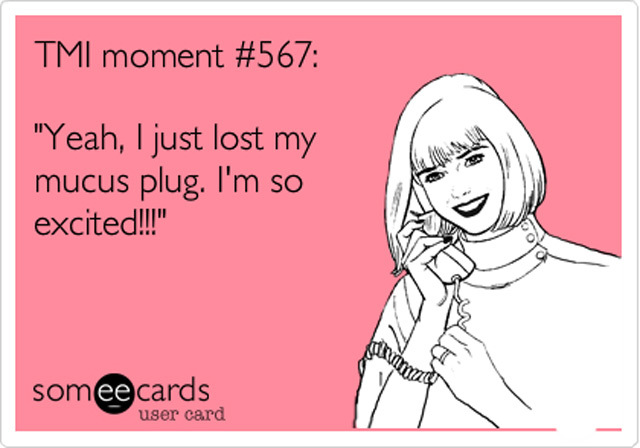 I also noticed that during said-upset-stomach-incident, I lost my mucus plug (gross I know!) and I did get quite excited about that, although I knew it meant labour could still be days or even weeks away. After we got home from my ridiculous shopping trip, we ate dinner and started watching TV. At about 8pm I noticed that I was getting some strange period-like cramps. They weren’t very regular but they were definitely bothering me. I thought they might be contractions but they didn’t feel like ‘contracting’, they just felt like kind of aching pains that came and went. As the evening progressed, they got more and more frequent, until they settled down to a pattern of every six-seven minutes or so. I started trying to time them on an app, but after a while they stopped completely for an hour or so, before starting up again. I wasn’t entirely sure what was going on, but it did seem like something might be happening. I tried to sleep but it was really difficult as the pains kept waking me up whenever I started to drift off. 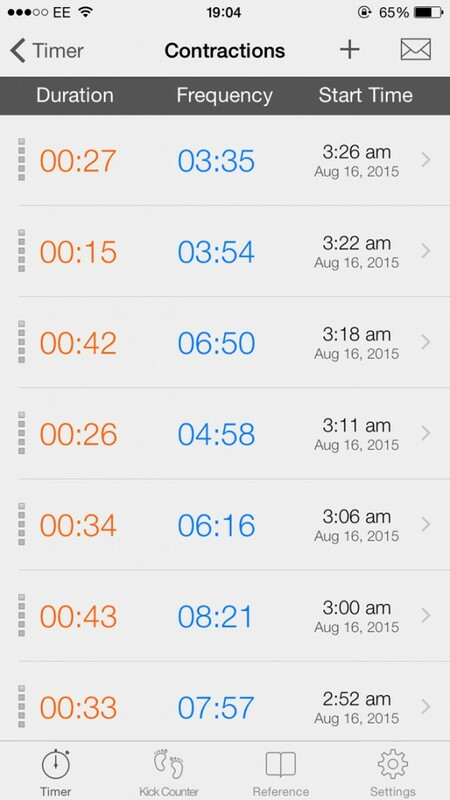 I reckon I got about two hours’ sleep that night. On Sunday morning, we went to Waitrose and although the pains hadn’t got any worse, they were still there, and bothering me a lot. 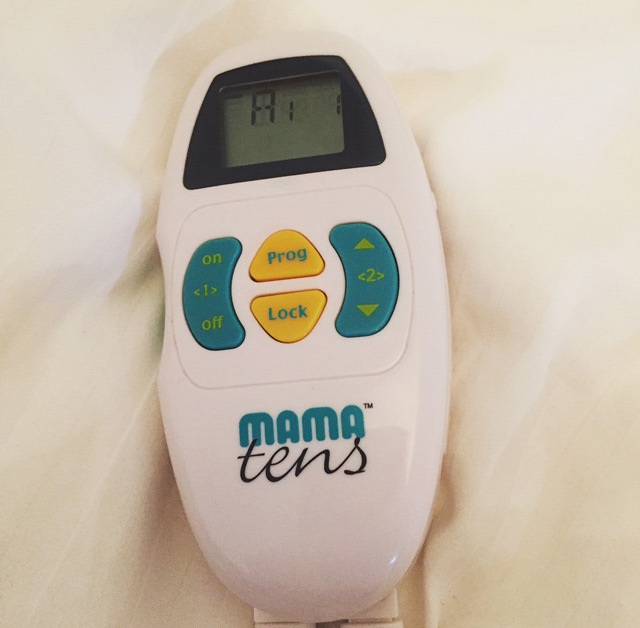 I cracked open my Tens machine, and it actually helped loads – in fact I actually carried it around Waitrose with me, which now I think about it must have looked rather amusing. We spent the whole of Sunday waiting for something specific to happen, but nothing did, just this non-progressing regular pain. I did a LOT of googling of latent labour that day and spent the whole time praying my waters would break, but they didn’t. By 8pm on Sunday I was a bit frustrated, so we decided to go into the hospital. I had rung the midwife before and she’d told me to stay at home until I was having three contractions every ten minutes, but nothing seemed to be going in that direction and I was getting fed up and tired. At the hospital, they strapped me up to a machine that monitored the baby’s heart rate and also my contractions – which were only every 6-7 minutes still, and quite irregular, but really strong on the scale – the midwife actually raised her eyebrows as she watched one charting and said ‘Gosh that is strong and long.’ I think it was about 92 out of 100 on whatever scale they use to measure it. That was even more frustrating and I really wished I could have just stayed in the hospital, but anyway, we went home and tried to sleep. After half an hour of lying in bed, with the pains getting more severe although not closer together, I gave up trying to sleep and did something I NEVER do: I ran a bath. I hate baths. There’s nothing I enjoy less than sitting in water that’s going cold while you stare at yourself naked and try to find a comfortable way of sitting, squelching your skin against the hard sides of the bath and desperately searching for a comfy way to position your head. No ta. But for some reason I was hopeful that the bath would help the pains and I also just couldn’t stand the idea of lying in the bed unable to sleep for another night. So I ran a really full, really warm bath, stuck on my hypnobirthing playlist and sat there in the dark for about two hours. The cat came and joined me, which was quite cute. He clearly thought I'd lost my mind. The hypnobirthing playlist did help to some extent, although I found it hard to concentrate – I only remember bits of it now, something about wandering through meadows and seeing violet flowers which meant I had courage or something, then going through another meadow and seeing red flowers which meant something else… dunno what now… massive blood loss ahead!? And then eventually, at around 2am, Oli came to find me (I think he thought I’d drowned or something). I told him the pains were getting stronger, even though they still weren’t regular really, and we decided to go back to the hospital. As soon as we made that decision, my contractions suddenly started to come thick and fast – they were lasting a lot longer and I only had a minute or two in between them. Trying to sit down in the car felt very wrong, and I suddenly started panicking that we wouldn’t get to the hospital in time (despite living five minutes’ away – ridiculous I know). Once we got there, as it was after 10pm, we couldn’t go in the direct entrance to the maternity ward as it was locked, so instead we had to walk through the entire building from the main entrance to get to the right wing. This ‘walk’ was definitely one of my lowest points – I remember clinging onto Oli and telling him I couldn’t possibly make it, and having to stop and try to breathe through the pain every minute or so. It was kind of like it is on TV, actually. I wasn’t really aware of anything but how much it hurt, and how hard it was becoming to walk. I also got irrationally angry with the hospital's architect, and shouted about how stupid they were for building something so big and for having a maternity ward so far from the entrance. Thankfully there weren't many people around to witness my ridiculous woman-in-labour tantrum. Eventually we arrived at the Carmen Suite – the midwife-led unit, with the lovely birthing pools. It was very quiet and dark there, but we were seen immediately by a surprisingly (for the time of day) jolly midwife who checked me over and said I was finally 4cm dilated (you have to be 4cm dilated for them to consider that you are in active labour). 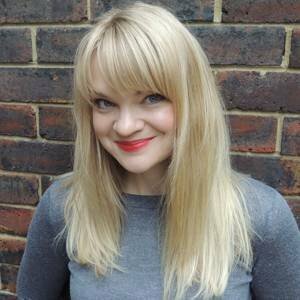 She let me stay – hurrah! I was so pleased. I was less pleased, however, when she said she was going to give me another sweep. I’m still not sure exactly why she decided to give me another one – I was too out of it to ask, but anyway, it ruddy hurt.